pleased to find their free digital images on their blog! I used this beautiful floral and sentiment to create a set of note cards. For two of the cards I created a sponged background before printing the set. I used one sheet of card stock and created my layouts in the MDS software which helped me to create all 4 cards quickly and simply. and printer the past two days that I am pulling my hair out! Maybe it just wasn't meant to be but I am going to post them anyway. creations the team created, so be sure and stop in for a visit. Terrific cards! I really like the one with the green ribbon fed through the punched holes! Such a beautiful collection of cards using our colour challenge for this week! Love the softly sponged one it simply looks amazing! Fantastic!! I adore them ALL, but am really taken by the cards that you have left as line art and coloured over top of the image, that's so clever! 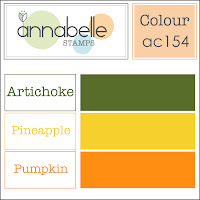 Thanks so much for sharing at AnnaBelle Stamps! Hey, Patti! I just posted the announcement on our Daydream Design blog that you are the winner for our blog hop. Just email (on my blog) to claim your $20 voucher to the store. Thanks so much for playing along. Four beautiful, elegant cards Patti and I see you have won the blog hop!! Congrats! Such a wonderful collection of cards Patti...........So glad you could play along with AnnaBelle! I absolutely love your set of note cards, they are all so beautiful. Lovely cards...creative use of the digis. Saw that you made the Top 3 at Annabelle's. Congratulations Patti! I know you will enjoy shopping at Daydream Designs. We love our blog hoppers. Your card creations are very nice. Beautiful set of note cards!!! Congrats on the DD hop win!! !